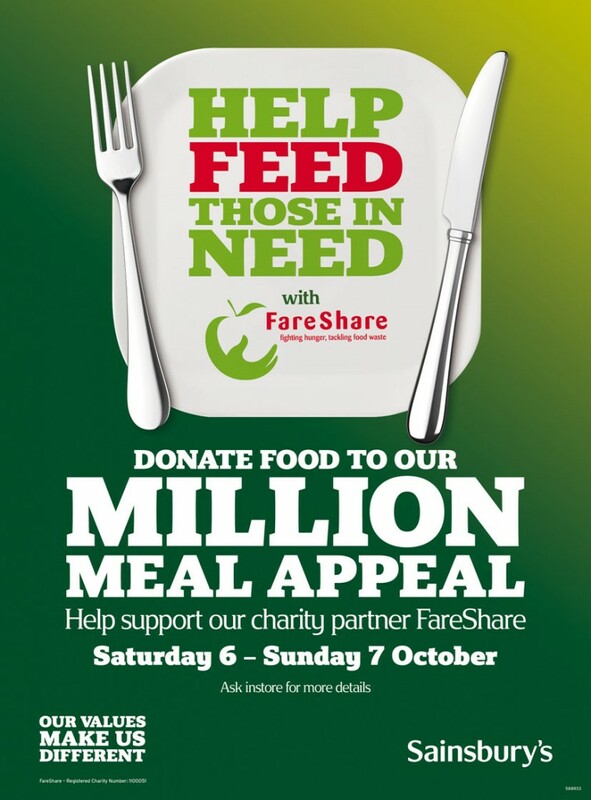 Last year shoppers’ donations helped food redistribution charity Fareshare beat by 200,000 its target of collecting enough food for 1 million meals – a total of 1.2million meals. They are hoping for similar success this weekend, 6th & 7th October, when their Million Meal Appeal takes place at Sainsbury’s supermarkets across the UK. FareShare‘s usual way of working is to collect food that food retailers such as supermarkets are unable to sell and would otherwise throw away – 3,600 tonnes of food last year – and then distribute it to a network of some 700 organisations in the UK, such as church groups, hostels, women’s refuges and school breakfast clubs. Last year they fed 36,500 vulnerable people each day. They typically get fresh but perishable food, and they don’t usually get many non-perishable items such as pasta, rice, tinned food etc. 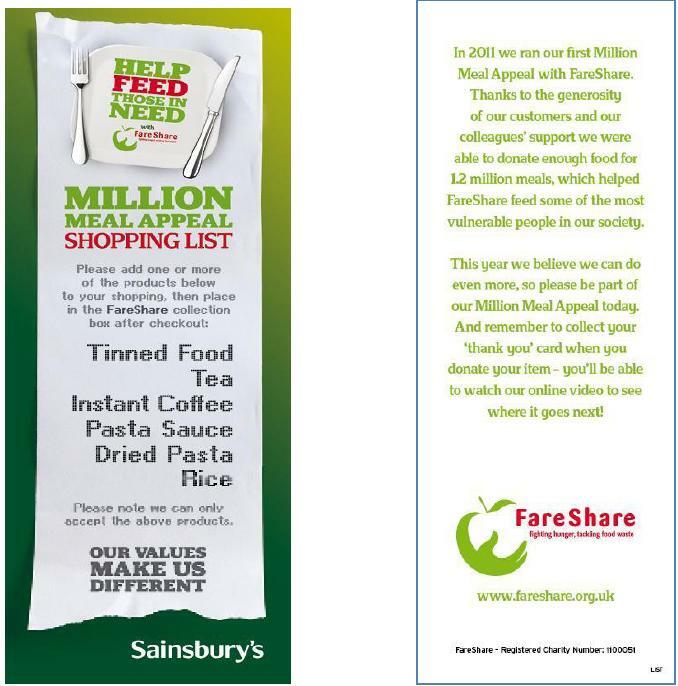 The Million Meal Appeal asks shoppers to buy an extra food item from this list and donate it to the FareShare trolley on their way out of the supermarket. Last year Sainsbury’s matched shoppers’ donations. Fareshare have recruited 600 volunteers for this year’s appeal, though they still need more. Volunteers greet customers, give them the shopping list and encourage them to buy an additional item of food for FareShare. Last year shoppers at Sainsbury’s in Woolwich and Greenwich filled many shopping trolleys with food donations; hopefully this year we will be just as generous.